It’s storage time at the Pickering Farm in this circa 1911 photo. A. salesman on the right watches as corn stock silage is blown into the silo on the left. The silo is about half full. as the lower windows are boarded up and a man sits in the third window above the tractor. 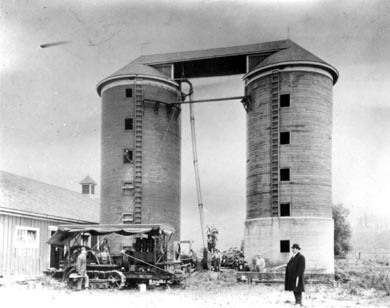 Roy Pickering is in the middle of the photo, standing between the two silos. The tractor is a Holt caterpillar with a 4-cylinder engine and a single front wheel for steering. The current Caterpillar Tractor Co. was formed in 1925 when it bought out the Holt and Best tractor companies.